The recent announcement of the introduction of the 4-Stroke Sprint (4SS) Class into Karting Australia Club Level Competition in 2018, has created a lot of excitement in the karting community. The first shipment of Briggs & Stratton 206 engines is expected to land in Australia this week, at the same time the initial batch of Torini 210 Clubmaxx engines are beginning to be distributed across the Country. In the initial announcement it was made clear that the 4SS Class would compete on a hard compound tyre. The slick tyre that has been chosen for use in Competition in 2018 is the Vega VAH tyre. 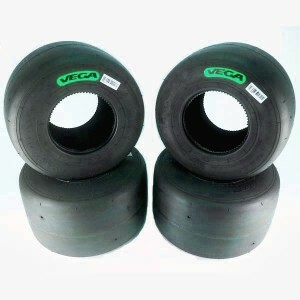 Vega will also supply the W2 wet tyre for Competition use. These are separate to the tyres that will be permitted for use in 4SS social karting. “It is important to have a quality tyre for use in Competition and in the Vega VAH we have got that,” said Karting Australia CEO Kelvin O’Reilly. The 4SS tyres will be distributed in Australia by International Karting Distributors who will also distribute the Briggs and Stratton 206 engines. “The introduction of the 4SS Class into Australian competition is very exciting. The interest level from the karting community has been incredible and now that we can confirm the Vega tyre will used in Club Competition throughout 2018 it puts into the place the final piece in the puzzle,” said International Karting Distributor Managing Director Ian Black. In a further emphasis on the 4SS Class being focused on grass roots participation, Karting Australia has also confirmed that drivers can utilise any of the 12 approved Karting Australia tyres on a 4SS Kart for social karting and practice outside of race meetings. “The 4SS Class is focused on grassroots and providing people with the opportunity to experience the sport of karting at a low-cost,” said O’Reilly. “It bridges the gap between rental karts and thoroughbred 2 stroke karting and provides a cost-effective entry point into karting competition.